The Lenovo Yoga Tab 3 Plus is the newest tablet in the Yoga lineup and like it’s siblings it comes with an integrated kickstand and a very big battery. Lenovo is offering us a high resolution display with middleclass hardware. How good is the Yoga Tab 3 Plus? That’s what we want to find out with this review. 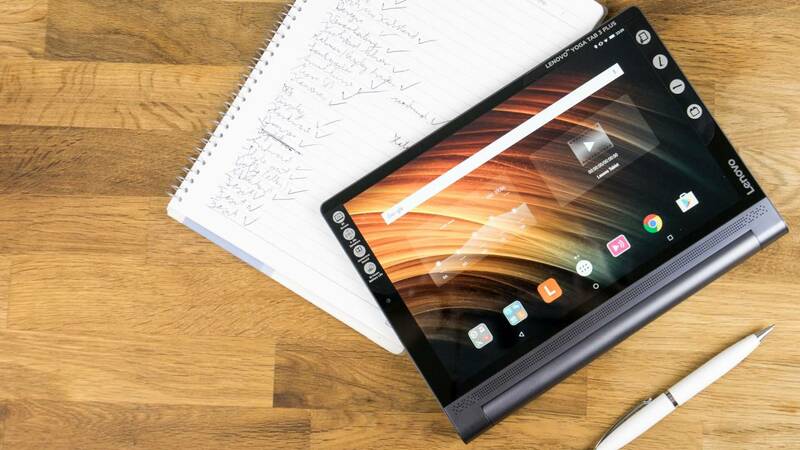 I really like the Yoga Tablet lineup because of its innovative design – there are not a lot of competitors who offer an integrated kickstand and go big on their battery. On the bottom is a kind of handle which lets you hold the device easily. Inside the handle sits the battery and also the integrated kickstand. You can position the kickstand in several angles. It’s especially useful for watching movies – with other tablets you often have to buy a separate kickstand which you have to remember to bring with you. There’s also a hole inside the kickstand so that you can hang the tablet somewhere – for example in the kitchen or bathroom. The kickstand and bezel are made out of aluminum. On the back there’s plastic with a kind of fake leather texture which actually looks and feels quite nice. Over all the build quality is quite good but with my version there are two issues. It’s actually quite hard to pull out the kickstand, the mechanism is not smooth at all. That’s not the case with other Yoga tablets and I didn’t notice it during IFA where it was announced. So it might just be the case with the one I got. With a bit of pressure you can also pull away the bezel form the display a bit – obviously you shouldn’t do that on purpose, it is not a huge issue. Under the display is a speaker bar with four JBL speakers which provide a nice sound. There’s a webcam on the side and on the back of the handle sits a 13 megapixel camera. On the right side are the volume controls and a USB Typ C port. On the other side is a headset port and the power button which is integrated into the handle. Lenovo placed a microSD card slot under the kickstand. The IPS display of the Yoga Tab 3 Plus is 10.1 inches big and an aspect ratio of 16:10. It has quite a high resolution with 2560 x 1600 which makes it have a higher pixel density than the ASUS ZenPad 3S 10 and Samsung Galaxy Tab S2 9.7. It is quite bright, has good viewing angles and the colors are nicely saturated. Over all the display is very nice, I’ve got nothing to complain here. For under 300 dollars it is one of the nicest displays out there. Inside the Yoga Tab 3 Plus runs a Qualcomm Snapdragon 652 octa-core chipset with four cores clocked at 1.8GHz and four cores running at 1.2GHz. It comes with 3GB RAM and the internal storage has a capacity of 32GB. There’s support for WiFi, Bluetooth, GPS and you can get it with 4G LTE as well. Qualcomms Snapdragon 652 is a solid middle class chip with quite good benchmark results. In Geekbench 4 the tablet gets 1322 points in the single core test and 3288 points in the multi core test. On AnTuTu it gets a result of 78726. As you can see in my comparison chart it hold up quite well against most competitors. So the performance is pretty good in the benchmark tests and my gaming test shows that as well. I could play games like Dead Trigger 2 and Modern Combat 5 very smoothly and it’s a joy to play Asphalt 8: Airborne as well. There might be some very minor lags from time to time but overall the gaming experience is very good. Other apps run smoothly as well. I had no problems playing around with apps like YouTube or Lightroom. In Chrome you can have a lot of tabs open and there are no performance issues. Lenovo is shipping the Yoga Tab 3 Plus with Android 6.0.1 Marshmallow – no Nougat yet. The UI is customized a bit but not as heavily as we see with Samsung or Huawei. The quick settings and notification bar look a bit different but that’s mostly it. Usually I like vanilla Android a lot but I missed the Multi-Window-Feature that a lot of other manufactures are including with their custom UIs. There’s a bar that you can pull out via a gesture to change basic settings like brightness and volumes and also add some effects though. Sound is quite important with this tablet and the four JBL speakers are quite nice. There’s also a Dolby app preinstalled which lets you customize the sound. There’s a big problem with the sound though while watching movies. When watching YouTube or other video apps the audio track is not completely in sync with the video. Sometimes it’s barely noticeable, but sometimes there’s a delay of up to 1 or 2 seconds. I did a recording of a YouTube video that is perfectly in sync – not so on the Yoga Tab 3 Plus. Lookout for the mouth movement and the sound. By now Lenovo is aware of this issue and there’s a topic in a support forum on it’s German site. You can solve this issue by deactivating hardware acceleration for each app in the settings. That’s not a perfect solution though. It still is a big issue until Lenovo is releasing a software update to fix this. The battery life has always been one of the highlights of Lenovo’s Yoga tablets. The Tab 3 Plus has a battery with a capacity of 9200mAh which is very high. It should last for up to 18 hours and that actually might be the case if you don’t do much with it. In my battery test I got a runtime of 16 hours. It’s not 18 hours but 16 hours are still very good. I always do the same battery test in all my reviews. I’m running a 720p video until the battery dies. Brightness is always set to 50 percent, WiFi is always activated, audio is turned off and apps like Facebook or Twitter are not installed. There are coming in a couple of notifications from Gmail though. I really like the design of the Lenovo Yoga Tab 3 Plus – I wish more manufactures would give us an integrated kickstand and a bigger battery. The display is very nice as well and the performance is pretty good for its price point. There are some issues though. If you’re willing to spend a bit more you could get a metal case with a competitor and even a fingerprint reader. Both features are missing here. If you want to get the Yoga Tab 3 Plus I would suggest to look out for the kickstand, check if you can pull it out smoothly. As said, that was not the case with the one I got. There’s also the issue with the audio. Lenovos Yoga Tab 3 Plus has the potential to be a very nice media tablet – but not with audio that’s out of sync with video. I will use tablet 4 watching movies and youtube.. I dont care about gaming. do u think its worth it to buy lenovo yoga tab 3 plus and stuck with Android 6.0.1 Marshmallow ?? or better to buy another tablet with Android 7.0 nougat ?